Hello I hope all is well for you and yours. I was introduced to this system for free by a mysterious professional who called himself Raj. Someone showed him the system and he like i am paying it forward so to speak. This system is very simple yet very powerful when used correctly. I am not going to go into great detail here on the post. I will provide the free pdf manual that i was given to you for free. Ill post a brief description and a couple examples. Enjoy and pay it forward! I was wondering how long it would take for the pdf to appear here on this site - I am the author! I am glad to see that you are finding it useful. I still use the same concept although I do not stick strictly to the 6/6(shift 1) that the method is mainly about and I only use it with my own method. There is still discussion and examples carrying on on that site if anyone wants to follow this in more detail. It is a good little system if one remembers to stick to the parent/child multi timeframe requirement and the money managment side - otherwise it will whipsaw…it is a useful method in moving markets and can earn pips but will not make you rich very quickly! Some traders got on fine with the method but others for some reason didn’t manage to make a profit overall and moved on…as is normal with any method. Many comments confirmed that this is such a simple method that it works very well as a confirming/timing tool when combined with another core trading method. This was particularly so with longer term methods. An outstandingly well-written and presented PDF, in my opinion. It’s the kind of thing that very occasionally comes along and makes me “miss my indicator days”: it’s simple, straightforward, and completely logically based on sound underlying principles, needless to say. The first relates to the method described on page 20 of approximating the higher time-frame within the lower, to display everything on one chart. I note your proposed method of approximating this, between H4 and H1 charts by displaying the “H4 equivalent” on the HI chart in the form of a 24-period moving average, and of course I see how this is equivalent. My question: might it be a good alternative to displace the displaced “higher-TF-equivalent” MA by 4 periods instead of by 1, as well, following the same principle? Secondly, I was wondering whether you’ve tried calculating the MA’s on a purely median price, rather than on a typical price, i.e. H+L/2 as opposed to H+L+C/3? (I suppose the difference would be too small to be consequential, really?). You are pretty much right on both accounts. The higher the period of the MA’s the closer together the two lines become and eventually are hard to distinguish except on a strong move. In that situation it does help to change the shifted MA from +1 period to, say, +2 periods. However the downside is that on the current bar the two lines are quite wide apart and that can make it difficult to see whether they cross or not - but since this is by definition the synthetic higher TF then there is plenty of time to wait until it is clear. Also these two ends of the synthesied MA are kind of repainting on the close of each short TF period and can give a false signal before completion of the next long term period - and the effect of this is maybe accentuated if the displacement is as much as 4+. I have found that 2+ is usually enough to keep a clear gap between the two lines. Secondly you are right that using a median does not really change much compared with the typical method. One clear benefit in using this ribbon is that it is extremely responsive to changes in direction. For this reason it is also used by price action traders to help refine their actual point of access. E.g. if trading a bounce off a support level then one can wait for the ribbon to cross after the level has been touched before actually entering. The content of the pdf is really just a summary of the postings and examples on that thread. I felt that it was becoming difficult for newcomers to find all the points once the thread became quite long (over a 1000 posts) but I also took the liberty of adding a few extras from my own experiences with it but which didn’t actually deviate from the main principles. Nice to meet you and thank youbfor the pdf great job creatingit it has helped many people. By the way Chris is back and active on the site. Thanks, good to hear that it has been useful! I agree - I’m surprised, too (though I see the PDF attached to the OP has had 175 views). There are clearly large numbers of struggling members here who would be able to trade this system - and/or variations of it - successfully, given enough patience, discipline, care and the willingness to study it in detail and practice it extensively. from what i see it could be converted into a good bot for automated trading. btw have you tried to instead tp have a TP of 1 simply make TP a counter crossover of the 2 SMAs? buy on crossover close at crossover of different direction? gives a undefined tp but better chances for higher gains and ususlly in 90% of cases of winning tradws a tp which is higher then times 1. We did talk about this with some of the regulars who were trading this method and it was generally felt that it was too difficult because of the requirement for multiple timeframes, discretionary entries e,g, following large candles, and the choice of market timing. It needs an active market. It could possibly work but I somehow doubt it - but that might be just me, I am really averse to the concept of a computer trading my money and that makes me very biased! Actually, yes! I do not trade this method with just the double 6-period ribbon. I have added a couple of other bits to filter out some fakes and to keep me in some trades longer, either totally or partially. Basically, I am looking at 3 TF’s where the longest gives me my direction, then middle gives me my entry and the lowest my exit on either a crossover or a significant close through the ribbon. For example, a 1H chart and 15M function as the “method” here, but the 5M tells when it is weakening or time to get out. This can work equally well with say 1D and 4H as the “method” and the 1H or 30m as a close (I have never actually tried it on these longer periods, but others have apparently). But this is not really intended as a method to generate big income or catch big moves. Its beauty is that it brings in regular smallish “bread and butter” pips. A number of traders on the other site were long term position traders and they used this to either trade short term against their positions or simply to give them something to do each day! For this reason it is a rather boring method for many traders but, having said that, I am a firm believer that it is easier to get 10 pips with 10 lots than 100 pips with one lot! - and this method has now in May given me 29 trades with only 7 losses and only 2 of those losses were stops hit. I thought I would post here, only by way of clarification, how this method can work. 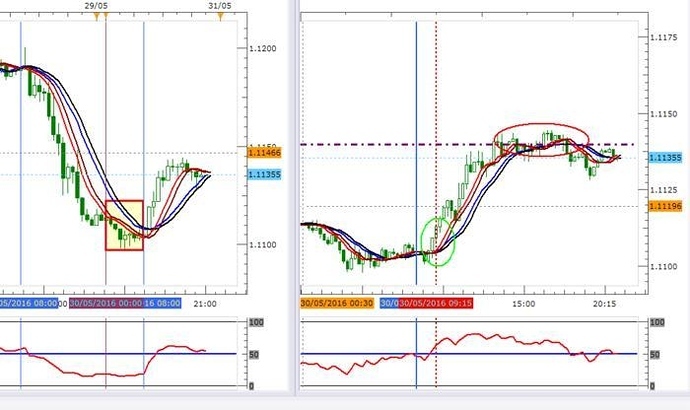 This is the EURUSD for today and the left hand chart is 1H and the right hand is 15M. You can see on the 15m chart that the ribbon crossed immediately in the morning (london time) and that the RSI also moved above the 50 level (red dotted line). At the same time the 1H ribbon was also crossing to the up side. Both the 1H and the 15M remained upwards until they reached the daily pivot level (which on a UK/US holiday was very likely to hold as a technical level) - only a 25 pip trade but an easy one! If you also look at last Friday’s move on the left hand 1H chart you can see that was also a very clear ribbon and a bigger move. It doesn’t always work quite so clear as these but at least this gives some idea of the method. BTW the red ribbon is the 6/6+ ribbon of the method and the blue ribbon is my own addition and comprises 12/12+ periods. Thanks for the charts (I’m having a sneaky day off, today, because of the Bank Holiday). Do you normally trade this from H1/M15 charts, as illustrated above, or ever/sometimes from M15/M5 charts? Curiosity compels me to wonder how it does on futures with similarly related constant-volume charts (I’m guessing “even better”, but of course I would say that, wouldn’t I? :8: ). To be honest, Lexy, that is a difficult question for me to answer. Yes, I do trade 15m/5m and quite often. In fact, as I mentioned earlier I tend to watch all three of these TFs side by side and the emphasis tends to swing from one side to the other depending on the way the day is going. I mean, when the 1H is as decisive as in the above chart there is no need to work with the 5 min too much, but sometimes the 1H is a bit unclear whilst the 15m/5m charts are oscillating beautifully. This is one of the reasons why a bot would be difficult because it wouldn’t be able to discern which charts to follow. But I have to add that I have modified the 5m method quite a bit. For example, the 5m 6&6+ works great in a healthily moving market but tends to criss-cross a lot on those long, slow days that we get now and again! I find that a smoothed SMMA instead of the SMA filters out some of these “kinks”. But I also have another MA-based tool on which the price rides and provides a cushion either under or over the ribbons which again helps filter out these kinks. Like any method, 5m TFs are always more erratic and can easily give false signals and premature exits, and entry precision is far more critical than with higher TFs - but you know all this!!! a good programmer could do the magic and solve the complicity of the different time frames. it needs a good trader that identifies the rules that must be setup for the program on which it chooses its time frames etc but i think its possible. it takes time effort and a professional programmer. one of my friends is doing only autonated trading and hes earning big money. he cant programm for sh!t but has 2 programmers employed on a regularly basis, the last bot costed him €85.000 to programm. unfortunately he refuses to sell me his bots but he keeps no secret of his programmers. im on the look for quite sone time for a simple bot that trades the foreign exchange markets for me as i simply dint mess with forex at all. but five accounts trading each one pair and having a starting account balance of 10k each could give sone statistical value and maybe after a year theres a plus. and any plus u didnt work for is a gifted plus. if u dont mind ill let him check with his programmers if they can put sonethibg together on this as he is the pro in automated trading i got no clue about it. in fact i was once thinking amd contemplating to put the turtle system in a much smaller time frame into a bot for forex and commodities. from my point of view that should work out great as its not using any indicators or MA but has very strict rules on enter and TP which should be very easy to programm. sorry im shifting the topic to something else. didnt meant to do that i appologize. Thanks Turbo and Lexy, it is great to hear the enthusiasm in your posts! Turbo, of course you can talk with progammers about this! I want to emphasise that this is NOT my method, I am NOT promoting it and I did NOT even start this thread or bring the method to this site. But I DO trade it and I DO believe it is viable as either a stand-alone method or as a means of fine-tuning trade entries when “overlaid” on other trading systems. I have a core “method” that has been my trading method for many, many years and I only came across this ribbon method earlier this year, but it immediately fitted like a glove over my own method and they fused together in total harmony and synergy. (The above chart that I posted only includes the ribbon part as that is what this thread is about). Again, I emphasise this is NOT my method, nor do I wish to be its promoter here, I am just a trader. But if anyone is trying it then I am more than willing to help and comment on it. “My recommendation again for traders “in the making” would be to study a particular strategy and just keep following it – follow all its rules, constantly, and consistently. Just to give you an example of where I was ten years ago, and where I am now, just look at these 5 charts. I entered these trades yesterday, and they have made 3K in 24hrs on one standard lot. This can be done every few days, by every one of you. I think that is a rather good recommendation! I wish you every success with that and will be very pleased to hear your feedback! I cannot comment on its success likelihood because I have never looked at NQ futures or traded volume-based. But in theory there is no reason why the method should not work on any market provided the price action is active and relatively continuous and moves smoothly through the prices rather than jumping about erratically like with some low-volume or exotic products. However, I have found that while looking at a forest, we often can’t see the trees. Could time be a better indicator that RSI. I love my boxes and you have identified a very tradable box. And I use time as my confirmation signal. Likewise, when experimenting with bots in my earlier days found that MA’s have a sort of self forfilling property at the right time of day. Just throwing it out there. Time of day is so overlooked cause it’s not a s|e|x|y indicator.